The Toledo Bend Project (Project) obtained legislative relief from several provisions of law in one of the major bills passed by Congress during the lame duck session in December. As part of the lands package that was included in the Carl Levin and Howard P. ‘Buck’ McKeon National Defense Authorization Act for Fiscal Year 2015 (NDAA), Congress made sweeping regulatory changes to benefit the Project, which is located along Sabine River where it is the border between Louisiana and Texas. 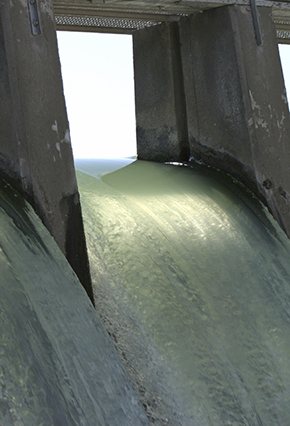 The Project is the only hydropower facility in the United States that is licensed by the Federal Energy Regulatory Commission (FERC) to two different states: Texas, through the Sabine River Authority of Texas, and Louisiana, through the Sabine River Authority, State of Louisiana (Authorities). The economics of the Project have long been challenged by a relatively small generating capacity (approximately 80 megawatts), as compared to its vast geographic reach. With an active storage capacity of 1,554,000 acre-feet and approximately 1,200 miles of shoreline, the co-licensees are responsible for managing approximately 200,300 Project-owned acres within the Project boundary, in addition to nearly 4,000 acres of federal lands managed by the U.S. Forest Service (USFS) as part of the Sabine National Forest (SNF) and Indian Mounds Wilderness Area (IMWA). In the 1980s, Congress alleviated some of the unique regulatory burdens associated with the Project by authorizing the licensees to purchase approximately 35,000 acres of federal lands occupied by the Project. While beneficial, the 1980s legislation did not result in the complete removal of all federal lands and ownership interests from the Project. As such, the Project remained subject to annual fees for the occupancy of nearly 4,000 acres of federal lands—much of which occurs in fragmented, small parcels along the Project shoreline in Texas. In addition, the Project was subject to mandatory conditioning authority of the USFS, even though the vast majority of the Project occurs on non-federal lands. Section 3088 of the NDAA resolves these challenges at the Project in two important ways. First, it provides that the Project is not subject to federal land use annual charges for SNF and IMWA lands that are occupied by the Project. Second, the legislation exempts the Project from the USFS’s mandatory conditioning authority under Section 4(e) of the Federal Power Act. Van Ness Feldman assisted the Authorities throughout the legislative effort, as well as during the recently completed relicensing of the Project by FERC. In August 2014, FERC issued a new 50-year license for the Project, adopting in all material respects the comprehensive settlement agreement reached between the Authorities and all federal and state resource agencies actively involved in the relicensing process. On December 19, 2014, President Obama signed into law the Tax Increase Prevention Act (Pub. L. No. 113-295), Section 155 of which amends Section 45(d) of the Internal Revenue Code to extend retroactively for 2014 most of the tax incentives, including the hydropower production tax credit (PTC) and investment tax credit (ITC) provisions, that expired in 2013. The underlying bill (H.R. 5771) was passed by large majorities of the House of Representatives and the Senate on December 3, 2014, and December 16, 2014, respectively. A taxpayer is eligible to receive a renewable electricity PTC, or the energy investment ITC in lieu of the PTC, with respect to a qualifying hydropower facility if construction of the facility began before January 1, 2015. The Treasury Department issued guidance regarding the beginning of construction in May 2013. On December 18, 2014, the Council on Environmental Quality (CEQ) released updated draft guidance for federal agencies on how to consider greenhouse gas emissions (GHG) and the impacts of climate change in their National Environmental Policy Act (NEPA) review analyses. The updated draft guidance is a revision of draft guidance on GHG emissions issued by CEQ in 2010. Among other things, the updated draft guidance: discusses direct, indirect, and cumulative impacts analysis of a proposed action’s reasonably foreseeable emissions and effects; highlights the consideration of reasonable alternatives and the need to consider the short-term and long-term effects and benefits in the alternatives analysis and mitigation to lower emissions; recommends that an agency select the appropriate level of action for NEPA review at which to assess the effects of GHG emissions and climate change; counsels agencies to use the information developed during the NEPA review to consider alternatives that are more resilient to the effects of a changing climate; and advises agencies to use existing information and tools when assessing future proposed actions, and provides examples of some existing sources of scientific information. While the updated draft guidance is not binding on FERC, it could influence FERC’s NEPA analyses for hydropower licensing actions going forward. Comments to CEQ on the updated draft guidance are due February 23, 2015. The NDAA, discussed above, also enacted the Bureau of Reclamation Conduit Hydropower Development Equity and Jobs Act (Act). The Act authorizes the Secretary of the Interior to enter into leases of power privilege with non-federal entities to produce conduit hydroelectric power at 11 Bureau of Reclamation (Reclamation) projects in the West. A lease of power privilege permits a non-federal entity to generate hydropower at a Reclamation facility in return for a rental fee payable to the federal government for the privilege. In 2013, Congress enacted a similar bill to promote conduit hydropower development at other Reclamation facilities that were authorized under the Reclamation Project Act of 1939. Section 3087 of the NDAA applies to the remaining 11 Reclamation facilities that were authorized under the Water Conservation and Utilization Act of 1939. Together, these bills provide a framework for non-federal hydropower generation at all Reclamation conduits. As reported in the August Hydro Newsletter, President Obama nominated Colette Honorable to fill the FERC vacancy created by the departure of former Commissioner John R. Norris. Ms. Honorable was previously chair of the Arkansas Public Service Commission, a position she held since 2011. On December 16, 2014, the Senate endorsed Ms. Honorable’s nomination by a vote of 65-28. She was sworn in as FERC Commissioner on January 5, 2015. FERC now has its full allocation of five seated commissioners for the first time in four months. Honorable will serve out the remainder of a term that ends in June 2017. Comments on the Environmental Protection Agency’s (EPA) proposed rule regulating carbon dioxide emissions from existing power plants under Section 111(d) of the Clean Air Act (Proposed Rule) were due December 1, 2014. The agency received over 1.5 million comments on the Proposed Rule (also known as the Clean Power Plan). Several states filed comments related to the role of hydropower in the Proposed Rule, including New York, Montana, Oregon, Washington, and Idaho. State concerns included the status of regional hydropower in the determination of renewable energy potential, the status of existing and incremental increases in hydropower for compliance purposes, and accounting for annual variations in hydropower production in determining the baseline period. A broad cross section of the industry also filed comments. The National Hydropower Association requested that EPA consider a wider range of hydroelectric and marine hydrokinetic technologies, use a longer averaging period, and provide hydropower resources with comparable treatment under the rule as other renewable technologies. The American Council on Renewable Energy urged EPA to consider categories of at-risk and under-construction hydropower for the final rule as a means of incorporating existing and future generation into the framework. Investor-owned utilities commented on the determination of the baseline and status of existing facilities as a factor in compliance. Cooperatives and public power entities focused on the period for establishing the baseline and the status of incremental hydropower at existing dams for compliance purposes. EPA will now consider these and other comments. A final rule is anticipated in the summer of 2015. On December 3, the U.S. Army Corps of Engineers (Corps) announced that the National Marine Fisheries Service (NMFS) had issued a final biological opinion (Biological Opinion) on the formal Endangered Species Act (ESA) consultation process undertaken by the two agencies to reauthorize the Corps’ 48 existing Nationwide Permits and establish two new Nationwide Permits under Section 404 of the Clean Water Act (CWA). In general, nationwide permits authorize categories of activities that have minimal adverse effects on the environment to go through a streamlined permitting process. The Nationwide Permits at issue in the Biological Opinion authorize the Corps to issue permits for the discharge of dredged or fill material into “waters of the United States” under the CWA until March 18, 2017, at which point the Corps’ Nationwide Permit program will have to go through a reauthorization process. Federal agencies are required by ESA Section 7(a)(2) to ensure that any action they authorize, fund, or carry out will not adversely impact endangered or threatened species or result in the destruction or adverse modification of listed species’ critical habitat. Because the Corp’s Nationwide Permits “may affect” a protected species, the agency was required to initiate a formal consultation process with NMFS under ESA Section 7. The Biological Opinion only impacts 19 of the Corps’ 38 districts because these 19 districts are located in areas of the country where endangered, threatened species, and designated critical habitat may be impacted by the Nationwide Permits and because those districts represent the geographic area of the country that are subject to NMFS’s jurisdiction. There are several Nationwide Permits that may impact the hydropower industry: #3 Maintenance; #17 Hydropower; and #18 Minor Discharges. The Biological Opinion identifies 12 protective measures that the Corps will undertake to enhance the protection of endangered and threatened species and critical habitat – some of which will require additional pre-construction notifications. Examples of the protective measures include: (1) the Corps will provide guidance to its districts and divisions for conducting analysis on cumulative effects pursuant to NEPA, CWA Section 404(b)(1) guidelines, and the ESA; (2) the Corps will ensure that a list of information is provided as part of its preconstruction Nationwide Permit notifications; and (3) the Corps will provide guidance to its districts regarding the inclusion of a “special condition” to Nationwide Permit verification letters, which require permittees to report incidents where aquatic ESA listed species appear to be injured or killed as a result of discharges of dredged or fill material authorized by a Nationwide Permit. It is expected that processing times for Nationwide Permit applications in these 19 Corps districts will increase. Secretary of the Interior Sally Jewell has named Ross Hopper, currently serving as director of the Maryland Energy Administration since June 2013, to serve as director of the Department’s Bureau of Ocean Energy Management (BOEM). In addition to its management of oil and gas development, BOEM oversees renewable energy development, including ocean wave and current development, on the outer continental shelf. Ms. Hopper takes the helm from Walter Cruickshank, who served as BOEM’s acting director beginning in May 2014.